The CV-joint dust tripoid boot art. 1-05-1441-71 went on sale. 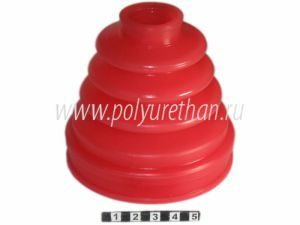 Polyurethane boots are very popular with buyers, because they are durable and perfectly protect from dust, dirt and resistant to ozone. This CV boot is used in Toyota CALDINA, CELICA, COROLLA RUNX / ALLEX, COROLLA SPACIO, COROLLA / ALTIS, COROLLA / FIELDER, COROLLA / MATRIX (NAP), ISIS, OPA, PREMIO / ALLION, RAV4, VOLTZ, WILL, VIS, OPA, VIRTZ, ALIS, VISVA, VOLTZ , WILL, VS, WISH. The full range of boots you can see on our site.